Christian Balinese artist I Nyoman Darsane was raised as a Hindu but converted to Christianity at age seventeen. Early in his artistic career he decided to embrace Christianity within the context of his own culture, which celebrates the arts particularly in religious activities and ceremonies. Because 86% percent of the population in Bali is Hindu, temple activities and local culture easily blend together so that there is a thin line between community and religious responsibilities. To avoid associations with Hinduism, the Church in Bali often pushes against local culture. However, Darsane believes he can both glorify God and celebrate his culture through art. His work portrays biblical characters who are ethnically and culturally Balinese in their actions and dress. When thinking about Jesus or any biblical character Darsane imagines them as Balinese, so he paints them that way. He believes that if Jesus came to Bali he would come dancing in traditional Balinese style and embracing the culture around him. One of his paintings entitled Sermon at the Seaside portrays Jesus preaching to the Balinese people on the beach through dance. 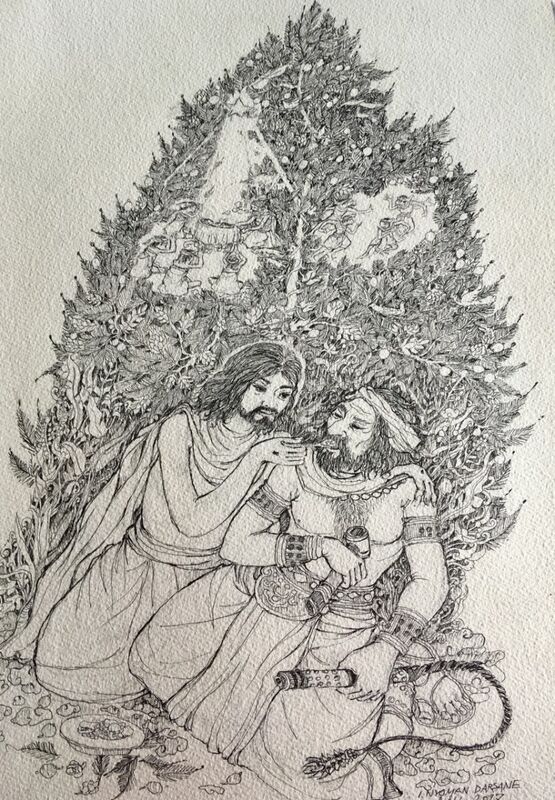 Besides his common theme of dancing Darsane has a series of pen and ink pieces that show what he imagines Jesus would do after the resurrection and before the ascension. In every piece Jesus is caring for someone in need. In the piece above Jesus is crouched next to a man whom he is feeding with nail-scarred hands. The man is one of the Roman soldiers who crucified Jesus, still holding his whip and hammer. The scene is the perfect representation of forgiveness, peace, reconciliation, and compassion. Behind the two men is a shape resembling a Christmas tree. In the tree is a nativity scene with the holy family, the magi kneeling in the traditional Balinese worship posture, and four dancing shepherds. However, the structure resembling a Christmas tree is actually a significant symbol in Bali known as the Gunungan or the tree of life. The symbol of the Gunungan originates from a traditional shadow puppet theater called Wayang Kulit that tells stories from Hindu epics. The Gunungan is a puppet presented to the audience at the beginning and the end of the puppet show. It serves as a symbol that bridges our material world to a spiritual one and informs people that a divine story is being told. The Gunungan in Darsane’s work stands as a marker to all who view it that the scene taking place is a divine one. Furthermore, a traditional Gunungan has a gate at the bottom that represents the gate to heaven, and the tree trunk in the middle of the puppet literally acts as the bridge between our world and the heavenly realms. In this piece Jesus is kneeling in the place normally reserved for the gates of heaven in a Gunungan, meaning that Jesus is the gate to eternal life. And the tree trunk bridging our world to a divine world is sprouting out of the center of Jesus’ head, again signifying that Jesus is the way to God. When I first saw this art piece, I thought it was curious that the tree is leaning slightly to the right. I assumed this was merely because Jesus is leaning toward the man and the tree is simply symmetrical to Jesus’ posture. However, I learned that when the Gunungan is used in a shadow puppet show, it leans to the right at the beginning of the divine story. And when the performance concludes, the Gunungan leans to the left to show the audience that the divine story is ending. Darsane’s tree of life is tilted slightly to the right. The resurrection is not the end, but the beginning of the divine story—a divine story that starts with compassion and reconciliation. I’m not sure when and where Darsane would claim this divine story ends—perhaps he would say that it is still ongoing. If so, as we continue this divine story together, may we look to this piece of artwork and mirror the actions of Balinese Jesus. I Nyoman Darsane: God’s Eternal Love, 2017, pen and ink, 13 ½ x 19 inches.